"Steamboat North Star. Built at Cleveland in 1854. Length 274 feet; 1,106 tons; splendidly furnished for Lake Superior line; speed 16 miles an hour; burned at Cleveland in 1862. From "American Steam Vessels." copyright 1895, by Smith & Stnton." "Propeller Ironsides. Built at Cleveland, O., in 1864. Length over 231 feet; tonnage 1,123; an elegant passenger propeller built for the Lake Superior line; transferred to Lake Michigan and lost at Grand Haven in 1873 with twenty-four lives." "Wreck of Monarch, Isle Royale, Dec. 7. 06" Reverse: "Published by W.T. McKachren." 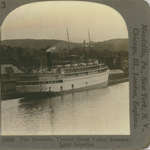 C. P. R'y Co. - Steamer "Manitoba". "C. P. R'y Co. - Steamer "Manitoba"." "Union View Co., Publishers Rochester, N.Y." "Lake Superior and Minnesota"
"C. P. R. Great Lakes Steamer In Canadian Lock at Sault Ste. Marie" "G. F. Gillespie"